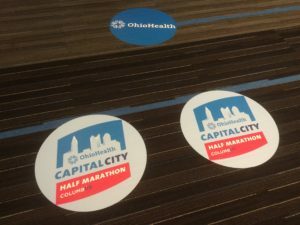 Candace lives in Columbus and REALLY wanted to run this race, especially after she saw the new medal design (yes, we are true suckers for sweet bling). While she said I could sit it out, we all knew I’d be toeing the line with her. So I ended up registering late, as in just a few hours before the registration cut-off. 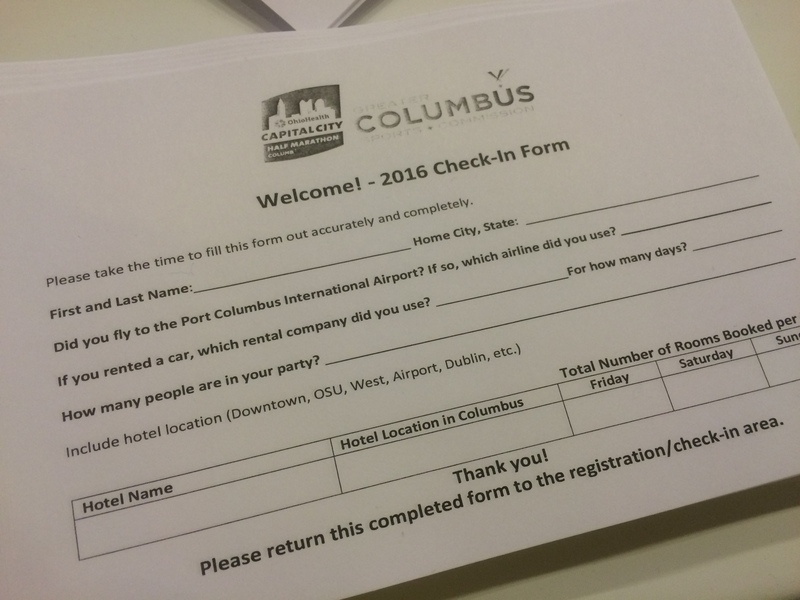 The expo takes place in downtown Columbus in a hotel adjacent to the convention center. I should start with 3 comments: (1) parking was cheap and easy to find, even on Friday afternoon during business hours; (2) the expo was very user friendly; and (3) the venue was VERY cool with an awesome viibe, which makes for a unique and fun expo venue. It was easy to find our way around and amongst the various exhibitors. 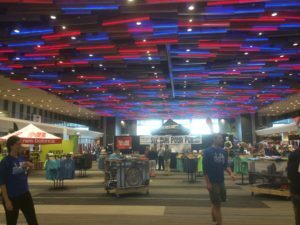 We did not see anything that we wanted to buy, but we did spent a lot of time talking to the corporate rep from New Balance as I am engaged in a protracted quest to find new running shoes for the rotation that work for me. Really, the only knock I have about the expo is a small one. For reasons passing understanding, the volunteers were instructed not to give out bibs until runners completed a questionnaire providing information about how they traveled to the race, where they stayed, what travel providers they used, etc. While, I can see why organizers may want to gather this information, making it mandatory, is, well, kind of b.s. 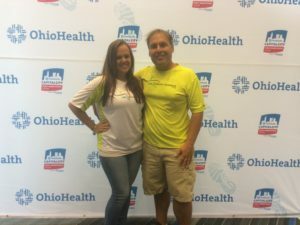 If you would like to ask runners to volunteer this information, sure, go right ahead. But making them complete the form before they can get their bibs may not be the best course of action here. I chose to write my name on the survey form so that it matched the registration, and left the rest blank. The volunteer, who was very polite, just gave me my bib and I was on my way. This race offers nice tech t-shirts (yes, short sleeves!) in both men’s and women’s cuts. They are the nice soft tech material that I prefer. This year’s logo featured a skyline of the city and highlights the neighborhoods in which the course makes its way. 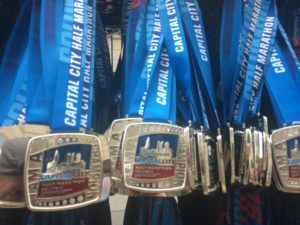 Even though I registered the week of the race, training was not an issue for me at all as I used this race to cap off a busy month of races that also included the Cherry Blossom Ten Mile Run, the Lake Health 10 Mile Drop, and the runDisney Star Wars 10k and Dark Side Half Marathon. Getting to the race requires driving downtown, which was not bad at all on a Saturday morning. However, once we got downtown, the road closures were confusing. It is not that the plan was bad per se, but it was indistinguishable what closures were race related and which were construction related, which result in one confusing moment where a sign directed us and other cars into oncoming traffic. However, we eventually found parking close to the finish celebration and were good to go. I have never seen such short bathroom lines at a large race before. They were abundant and well-staged throughout the pre-race area. The corrals had plenty of room to accommodate the runners without any crowding (now why can’t every race do that?). I did find it odd that they loaded from the front, not the rear, but in the end, it worked because the corrals were so spacious. We saw one woman climb the fence to get into the corral, and she slipped and nearly face planted on the concrete. She was fine, but certainly embarrassed. We did not feel the need to point out to her that the entrance was a mere 10 feet away and was wide open. However, this gives us the opportunity to let people know that climbing rails/fences/whatever to get into a corral is always a bad idea. Just don’t do it. The race started with a pretty solid rendition of the National Anthem and then a staggered start. I can say that, at least from my experience, I did not see any bad congestion at the start. Organizers seemed to do a good job of making the corrals the right size in terms of the number of runners, staggering the release, and then letting us out into an area of the course that was wide enough to accommodate us all. This made for a nice (and fast!) start indeed. We started just west of the Ohio Statehouse and made our way into the Arena District, past the home of the Columbus Blue Jackets. Maybe because my mind was on hockey at this point, but I noticed a large number of Canadian runners around me. I didn’t realize that so many of our friends from the North made the trip for this race, but it was nice to have them. There were some slight rolling hills in this section, nothing too bad, but it made for some nice, varied terrain. After exiting the Arena district we made our way out of downtown past the mile 1 marker and started working our way north. 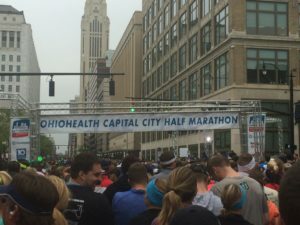 We passed a series of office buildings for the Ohio State University Medical Center which allowed the crowd of runners to sort itself out without worrying about congestion. During the next 2 miles we continued north near the Olentangy River. For those of you not that familiar with Columbus itself, for a large urban center, it is surprisingly suburban, which means that, just outside of downtown, we had a lot of park-like and tree-lined roads to enjoy. 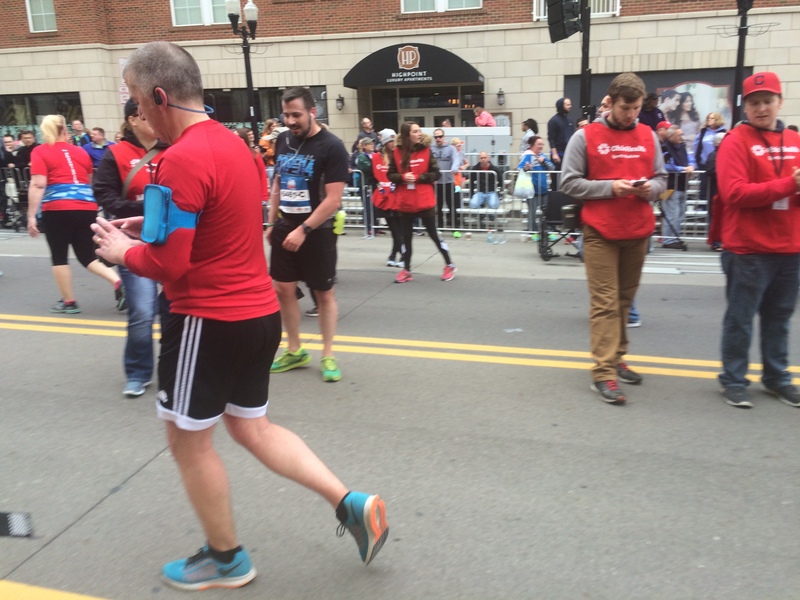 Just after the mile 4 marker we turned right to cross the Lane Avenue Bridge and make our way into the heart of THE Ohio State University Campus: we passed in between the basketball arena and Ohio Stadium, which you may know better as the Shoe! The next mile was all on Lane Avenue as we passed by the various University buildings before turning right onto High Street just before the mile 5 marker. I should add that while the crowds were not particularly heavy for the first 5 miles, I was pleasantly surprised by how many people came out to cheer the runners on. It was nice having that level of support on a race day. The next 2 miles were my favorite in the race. We just made our way straight down High Street, which turned out to be a hub of activity. There was plenty to see as we passed the rest of campus, the bars and restaurants, and the Quarter Marathon route rejoined us. This was also where the heaviest groups of spectators gathered to cheer us on. This stretch just made for a nice and enjoyable section of course, and was my favorite section of the entire race. After mile 7 we re-entered downtown Columbus and turned left and then right before we found the mile 8 marker. Up until this point, I was like a metronome. All of my mile splits were within 10 seconds of one another, and I was on PR pace, so I was feeling great. However, while I wouldn’t say that I hit a wall, this is where the race started to drag for me. With the exception of the area around the park and some nice homes, on a whole, the last 5 miles were just less interesting than the first 8 in terms of scenery and the crowds were noticeably smaller. By the time we turned back onto High Street and made our way into the Brewery District for mile 11-12, there really were no crowds to speak of at all. Organizers did a good job of trying to spread out entertainment, in the form of local bands. 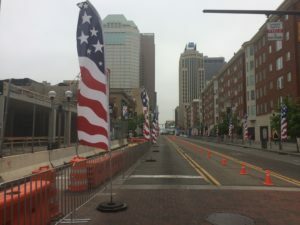 Around mile 12, we made a left turn to head across the river again, which is a nice part of downtown Columbus’ waterfront, but I think at this point we were all pretty much ready to be done. There is an old adage in golf that, no matter how poorly you play the first 17 holes, if you have a great experience on the 18th hole to finish, it will get you excited and eager to come back for more. Race directors and course designers should take a page out of this: while great starts are important, it is the end of your race course that will leave a lasting impression with runners and, ultimately decide whether they come back to take on the course or event again. Unfortunately, in spite of the great opening of this race, the last mile left many runners wanting more. 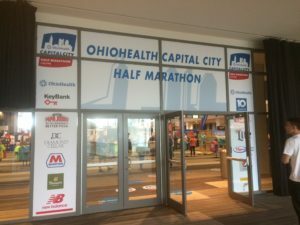 While I appreciated the elements of the bridge crossings over the Olentangy, there just was not all that much to the last 3 miles or so of this event. 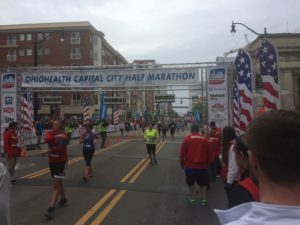 There were next to no spectators and the course swung so far from the finish area that runners could not even see the finish line until we made a sharp left turn just a few hundred yards from the finish. It kind of snuck up on us rather than letting the anticipation build. When I made the final turn towards the finish, I pinned my ears back and gave it all that I had left (which admittedly, wasn’t much) to make the last final push to the finish. I was pleased with my time, though I did miss my PR. This medal was, in a word, massive. It was huge. The designers did a great job of creating an exceptional tribute to this event. This thing is massive and is heavy, it will not be mistaken for any cheap throw away token. It also features a nice custom lanyard, so the SMO receives high marks all around. During this Spring race season I’ve been beating the drum of runner comfort. I am shocked that, of all of the places to save money from a budget, race directors would skimp out on providing mylar blankets at the finish, especially when there is a realistic chance that race day can be cold. 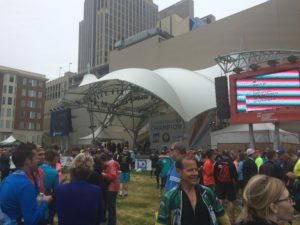 While the temps did warm up from the pre-race lows, I did feel that it was still cool enough out that, especially for those of us who were very sweaty, mylar blankets would have been welcome. Despite this, there were none to be found. 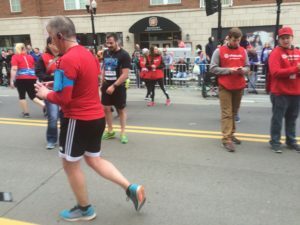 Even if the temperatures, by whatever metric you may choose to employ, do not expressly make mylars “necessary,” do your runners a favor and error on the side of their comfort, especially when they may have a several block walk back to their cars or public transportation in the cold, wind, and or rain. The rest of the post-race experience was solid. There were plenty of fluids (water, etc.) just after the finisher’s chute and a large selection of food. 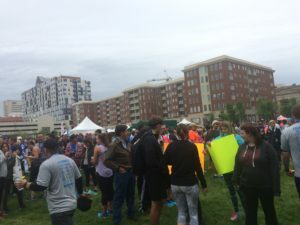 Organizers did a great job of funneling all of the runners to the post-race festival so we did not have to think, and who wants to think after a half marathon! The post race festival was nice. A live band played on stage as runners were treated to pizza, sparkling wine, beer, and the most amazing post-race treat ever: chocolate milk. This was a great event that was clearly well-planned and executed. We did not stay too long as we were cold and sweaty (again, no mylars), which cut our enjoyment short. We made our way back to the car and went in search of a nice hot shower. This is a well-run event with solid logistics, making for a predominantly runner-friendly event. The course does have some nice terrain elements, but is not overly challenging. Thus, setting a PR on this course is do-able, just ask Candace, who crushed her PR on this day! Congratulations Candace. Will I run it again? I am not sure. Like I said, the first 8 miles were much more enjoyable than the last 5 miles, which impacts my overall impression of the event. Additionally, my get-in price was high ($110 + fees) since I registered so late. I do not think that this race is a good value at this price point, though my feelings would be different if you could get in at a lower price point. I think this is a nice warning to race directors: I know that they employ tiered pricing to encourage early registrations, however, the higher pricing tiers can and do serve to discourage runners from registering later because the race becomes less worthwhile from a value perspective at the high price points.